Hurricanes, like Florence the storm about to hit the East Coast, are ill winds that blow no good. Unless….. you are an inland birder blessed by the blow with seabirds you never see on home territory, lifer birds driven inland by hurricane winds. When Hurricane Irma swept inland through Florida last year it dropped seabirds as far north and west as Nashville, Tennessee. Species included Brown Noddy, Royal Tern, Sooty Tern, Bridled Tern, Magnificent Frigatebird, Parasitic Jaeger, Sandwich Tern, Black Tern, Black-capped Petrel, White-tailed Tropicbird, Long-tailed Jaeger, Cory’s Shearwater, Sabine’s Gull, Great Shearwater, Pomarine Jaeger, and Band-rumped Storm-Petrel. 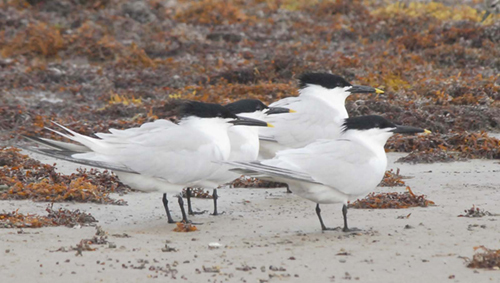 Terns were the most common birds seen inland. Many migrating shorebird species also were grounded in unexpected places. Birds were found in lakes and reservoirs in six states. Sightings were made for five days after the storm’s landfall. These sightings were tracked by reports made to Cornell Lab of Ornithology e-bird list. “These storms and the seabirds that they deposit can provide unique birding experiences and observations, respectively, with species that are normally hundreds of miles offshore flying over your inland yard or appearing at a local lake or reservoir," Cornell said in an understatement on storm reports. Right now you can track real-time sightings for Hurricane Florence from the web site eBird. It would be most unusual if Minnesota birders see avian refugees. Strong as she is, Florence isn’t that strong.